I did make other jams this year, I haven’t made a single post about them yet this summer. I did a batch of straightforward, low sugar strawberry jam and another batch of the strawberry with honey and black pepper that I did last year and loved. But then I’ve also made this cherry jam. 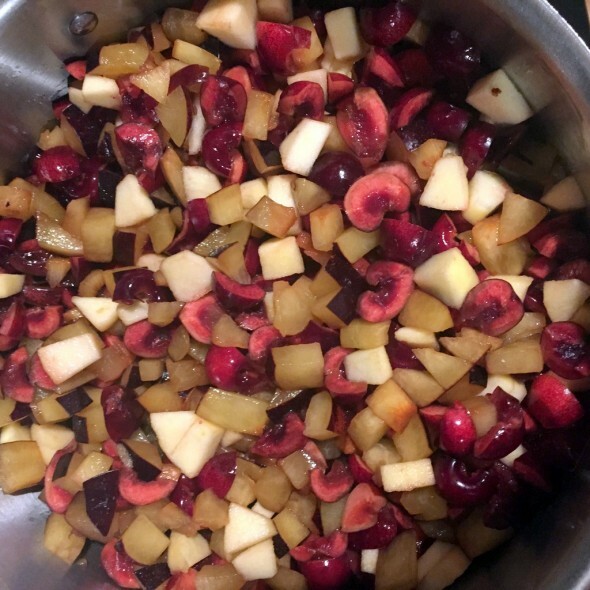 Which has sweet cherries and plums, so it’s got great cherry flavor with a little tang. I didn’t have quite enough fruit for the size batch I was making, so I ended up throwing in a couple of apples because I had them. 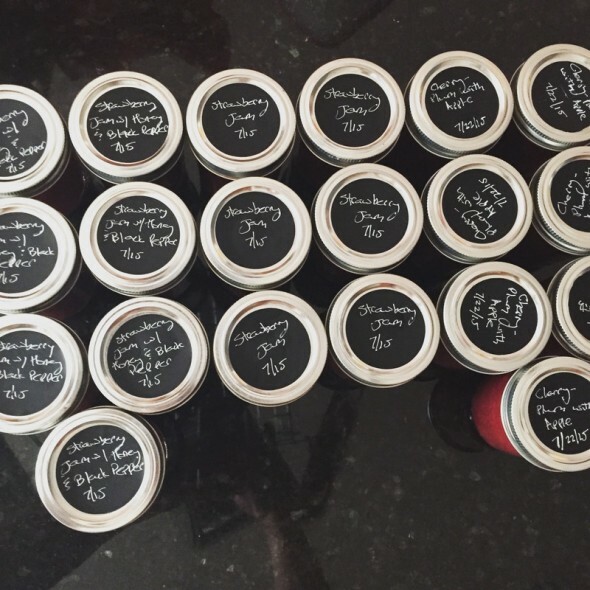 Which made it the best gelling jam I’ve ever made. Also, it’s freaking incredible on a grilled cheese sandwich. 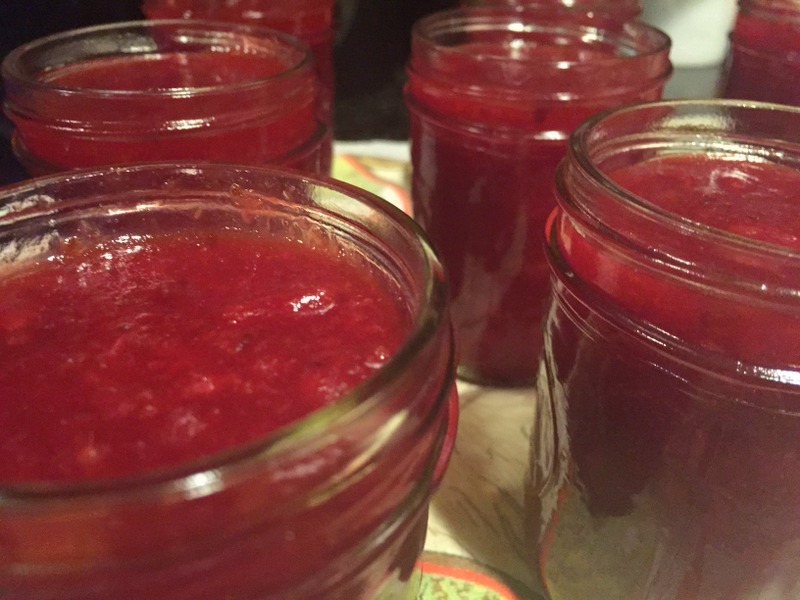 The recipe was inspired by a similar one in Food in Jars, which is one of my favorite jam resources. But I really like using Pomona pectin, which gels with very low sugar, and McClellan’s book uses liquid pectin. So basically, I followed the Pomona pack directions. My jams always come out well with that one. Put the calcium water in a non-reactive pot with the fruit. Mix the sugar and pectin powder together really well. 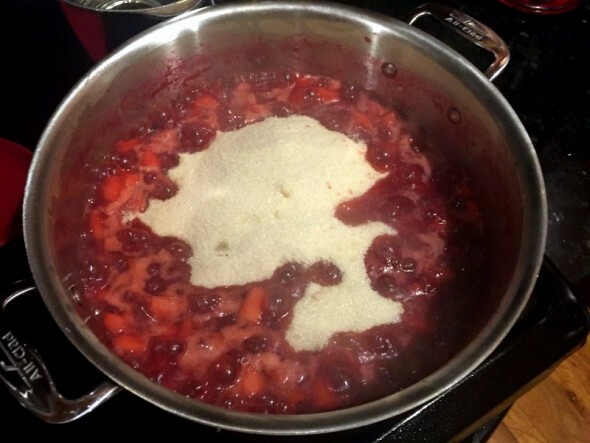 Bring the fruit mixture to a boil, then add the sugar mixture. Let the mix cook for another couple of minutes. Laena McCarthy’s book Jam On has the tip to stick some teaspoons in the freezer while you cook your jam. After you’ve cooked your jam (and really, it does not take long to cook), drop a dollop of hot jam on a frozen spoon. If the jam mixture gels properly and doesn’t run off the frozen spoon, you’re done. If it’s still runny like a syrup, cook a bit longer and retest. Add more pectin and sugar if necessary. Then, fill your jars, use a chopstick to swish around each jar and get rid of air bubbles. Put a splash of lemon juice on top of each jar of jam, wipe the rims with a wet paper towel. Screw on the lids, give the jars a gentle tap on the counter to get rid of more air bubbles. And process in a boiling water bath for 10 minutes. Then I added the jars to my collection of homemade goodies from this summer.